Many people tend to associate toys and treats with overindulged and spoiled ponies. Many horse owners can’t even imagine their horses using, let alone needing, a toy of any kind. After all, they’re horses, not pets, right? Well, they couldn’t be more wrong. Toys for horses can assist with proper digestion, eating behavior, add fun to your horse’s training and help promote herd play. If your horse has an overly high play drive, buying him various toys for horse can help take some of the pressure off his field-mates to entertain him. Toys can also have the double duty of training tools for your groundwork, play time, and under saddle work. Let’s take a look at some of the most common ones. Outdoor toys can be all the things that you already have around your barn that can be safely kicked, chased, pushed, tossed around or picked up and carried by your horse. For instance, rubber food tubs, buckets, large traffic cones, and plastic (not metal) barrels. Remember though, if you give your horse a plastic barrel to play with, first make sure that both ends are firmly closed off. 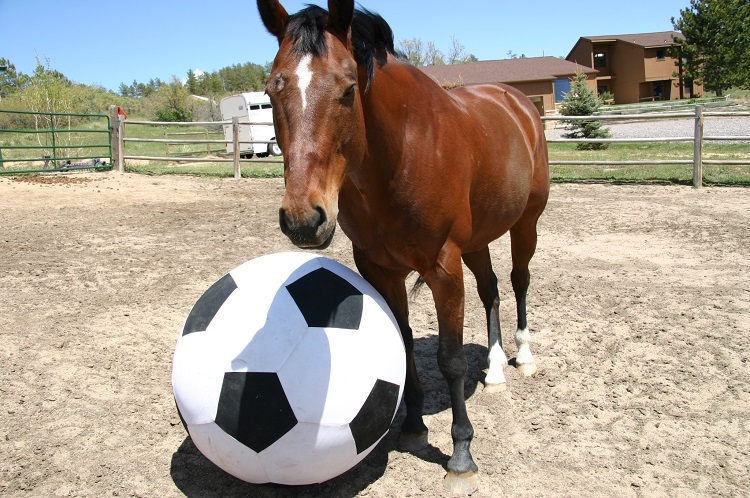 Buying toys for horse is always a good idea – for instance, rubber balls with handles are fun to fling around the pasture, and your horse will be amazed by the unpredictable bounce and motion. For horses who spend a great deal of their time in a box stall, especially for horses who are recovering from an injury and require stall rest, there is a wide array of simple toys that you can get. For instance, a ball on a rope would be very fun for horses to push and swing around their stall. If you decide to get this one, make sure that the ball is hung high, around wither-height, so that the animal doesn’t get a leg caught in the rope Furthermore, an empty plastic gallon milk jug attached to a rope and hung in the stall is another exciting and inexpensive swinging toy for your horse. It is a fun toy for your horse to twirl or bash around and make noise with. For some extra fun, you can even cut holes in the sides of the jug and put carrots inside it. Many horses enjoy playing with stuffed animals. If yours is one of them, you can usually find large, slightly used stuffed animals at garage sales at very low prices and make him happy. They will be fun for your horse to shake or toss around, and since they are rather soft – they won’t hurt him or anything that’s near him.